Peter Dickinson is an all-round musician. Probably best-known as a composer of many impressive works covering a wide range of styles, he is also an accomplished pianist and organist with a number of recordings to his credit. However, an essential part of his career has been his musicological studies. This has included major books on Lennox Berkeley, Lord Berners and Billy Mayerl. He is also an academic with a number of senior appointments over the years to music colleges and university departments. In 2014, Peter Dickinson celebrated his 80th birthday. Although a little late, this present literary retrospective of his life and work is a most welcome gift to all who value his achievement. A few biographical notes on the composer and the ‘librettist’ will be useful. Peter Dickinson was born in the lovely Lancashire seaside town of Lytham St. Annes on 15 November 1934. After studying at Cambridge where he was Organ Scholar at Queen’s College he began to compose. He showed his early works to Lennox Berkeley who gave him considerable encouragement. In 1958 Dickinson began study at the Juilliard School in New York. At this time he explored music by composers such as Henry Cowell, John Cage and Edgard Varèse. After returning to the United Kingdom, he spent most of the ‘day’ job as a lecturer at the College of St. Mark and St. John, Chelsea and later in Birmingham. He was the first professor of music at Keele University in 1974 and there established a centre for the study of American music. Further academic distinction included chairman of music at Goldsmiths College, University of London and Fellow and Head of Music at the Institute of United States Studies in London. Words and Music is divided into nine sections, each majoring on an important aspect of his career. I would recommend beginning an exploration of this book by reading ‘Some Autobiography: Three Musical Careers.’ This is a major expansion of any short biographical note about the composer. As the chapter title implies, it considers the interaction of pianist/organist, teacher/musicologist/author and composer, set in roughly chronological order. I think he got the title wrong –it should be at least ‘Six’ musical careers. One of several things that emerges from this chapter is just how many famous (and not so famous) characters from the entire world of 20th century musical and literary culture Peter Dickinson knows or has met. Stephen Banfield presents an 80th birthday tribute, which, after an examination of his career, concludes by declaring that for him, ‘Peter Dickinson the composer’ matters the most. The third chapter takes its material from articles and reviews written between 1958 and 1961 when Dickinson was a graduate student at the Juilliard School of Music. Fellow students included Philip Glass and Peter Schickele: the legendary genius P.D.Q. Bach. One review caught my eye: ‘Szell gives Walton’s Second Symphony: The Cleveland Orchestra 5 February 1961. He notes the ‘lyricism’ and ‘polished craftsmanship’ of the work, but argues it lacks ‘the vitality of his earlier work’. The Symphony was received ‘with enthusiasm and the composer was present to witness a most sympathetic performance.’ Fifty-five years later, this review still holds water: it is a definitive and succinct summing up in a hundred words of this much underrated Symphony. 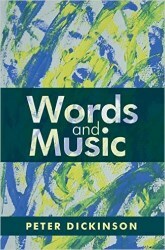 The major part of Words and Music (122 pages) is devoted to Peter Dickinson’s ‘Writings abut Music’. These varied essays, articles and reviews have been assembled from a wide range of publications. The reader will notice that not a few have are concerned with American musical subjects, such as ‘Charles Ives and Aaron Copland’, ‘The American Concerto’ and ‘Putting on John Cage’s Musicircus’. British and European subjects have not been ignored. A study of ‘Lord Berners: A British Avant-gardist’ appeared in the Musical Times in 1983. It is a precursor to Dickinson’s major study of Berners published by Boydell Press in 2008. He concludes this essay by suggesting that ‘No other Englishman could have come to terms so swiftly and easily with the avant-garde developments of the World War 1 period, and then used this experience towards music of a quite different type in ballet and films.’ Clearly, this eccentric, but astute peer, is someone that needs to be ‘revisited’ by British music enthusiasts. Another key essay is Dickinson’s study of African-American Influences on British Composers’. This is presented as a continuum from Delius whose work Appalachia and Koanga ‘forms a first chapter in [this] influence …’ through William Walton, Arthur Bliss and Constant Lambert. Subsequent references include Michael Tippett’s use of ‘spirituals’ in A Child of Our Time and the foxtrot episodes in Peter Maxwell Davies’ St Thomas Wake. Another critical essay is the study of ‘Style Modulation as a Compositional Technique’. Basically, this is where a composer uses ‘serious’ and ‘popular’ and ‘past’ and ‘present’ musical styles mixed together in a subtle and satisfying manner. This may be used sequentially or simultaneously. There is more to it than this, but it give the general idea. Interestingly, it has become one of the techniques used by Dickinson himself. Composers deemed to employ this method to a greater or lesser extent include Charles Ives, Billy Mayerl, Peter Maxwell Davies and Richard Rodney Bennett. Other articles include a tribute to the early music player and musicologist David Munrow, an appreciation of the composer ‘Wilfred Mellers at Ninety’ and an overview evaluation of a number of CD recordings of Lennox Berkeley’s ‘1940s’ compositions. If Peter Dickinson’s writings about music were not enough, Section V of this book presents a number of significant essays on literary ‘connections’. These include ‘Emily Dickinson and Composers’, the impact of T.S. Eliot on Stravinsky, Britten and Rawsthorne and a centenary tribute to the British poet Ruth Pitter (1897-1992). Two other papers make compulsive reading: Dickinson’s meetings with W.H. Auden and with Philip Larkin. Dickinson was to set a number of the Hull poet’s poems as ‘Larkin’s Jazz’ for baritone/speaker and five players, piano and percussion. I do wish that I had known about the three essays (Part VI) included here by Peter Dickinson about his own music. Writing my reviews of his many CDs would have been made considerably easier. The first article examines compositions written between about 1975 and 1987. This period was dominated by his attempt (highly successful) to use a popular musical idiom within a larger context and also to ‘determine a means of notating different kinds of music simultaneously.’ He discusses how this has been achieved in his Organ and Piano Concertos as well as Surrealist Landscapes and the Satie Transformations. The second paper examines why ‘Nationalism is not Enough’. Finally there is an analysis of Dickinson’s organ music ‘From Organ Loft to Rags and Blues’. This discussion ranges from the ‘English cathedral tradition’ of ‘A Cambridge Prelude’ albeit with a bluesy pedal part in places, to the transformation of MacDowell’s ‘To a Wild Rose’ by way of ‘blues and rags’. All of Peter Dickinson’s organ works have been recorded on Naxos 8.572169. Part VII and VIII of Words and Music include various interviews, travelogues and a memoir by Meriel Dickinson. Peter Dickinson has always appreciated Erik Satie, so the present imaginary colloquy between ‘Dickinson and Satie’ makes interesting reading. It was written for the Centenary on 17 May 1966, but was never broadcast or published at that time. He makes use of ‘genuine’ Satie comments and thoughts: it is the interviewer’s questions which are tailored to the answers. Also included is a discussion between Peter and Meriel Dickinson with the broadcaster Richard Baker (11 October 1994) and a debate between the editor of the Gramophone magazine, James Jolly and Dickinson, which took place in 2014. The final section of the book includes a chronological catalogue of Dickinson’s music. This begins with the early, above-mentioned ‘A Cambridge Postlude’ for organ and concludes with the orchestral version of the delightful Suite for the Centenary of Lord Berners completed in 2015. There are literally dozens of works composed in the intervening years. Many of these have been commercially recorded, and these are conveniently noted by an asterisk. This amounts to close on half of his compositions, which is an excellent state of affairs. I guess that we will have to wait for the definitive catalogue of works, including the apparatus of instrumentation, first performances, location of manuscripts, publications and reviews. Coupled to the works-list is a ‘Peter and Meriel Dickinson Discography’. This is usefully divided into two sections: works by Dickinson, and works by other composers. I was amazed at just how extensive these listings are. If I were to pick one example, it would be An Erik Satie Entertainment (1976) featuring both Peter and Meriel. This is their most successful and best-selling album: it did much to raise awareness of Satie’s music among the late twentieth century audience. Finally, there is an extensive index, ranging from Zez Confrey to Elizabeth Sprague Coolidge and from Walter Damrosch to Johnny Dankworth by way of Darmstadt. It reflects Peter Dickinson’s wide-ranging interests and attainments. It would have been useful to have included a bibliography in this book, detailing essays, books and reviews by and about the composer. As expected of Boydell Press, Words and Music is well-presented. It is printed on good quality paper, with a clear font. There are a number of musical examples illustrating the argument of the text. Included, are a number colour plates showing handbills for Peter Dickinson’s concerts and recitals as well as a remarkable collage of concert tickets made by the composer. Normally, in a book review I try to detail who the book will be of particular value to. In the case of Peter Dickinson’s Words and Music, this is not an easy task. I guess that just about everyone who is involved with 20th century music and literature will find a large amount of interest in these pages. Musicians, historians and listeners will discover that Dickinson’s writings on Ives, Satie, Barber, Copland, and Cage are of considerable importance. Essays on Lord Berners, Wilfred Mellers, Lennox Berkeley and David Munrow will be of use to British music aficionados. Of wider appeal are the articles on W.H. Auden, Philip Larkin and Emily Dickinson. Of significance to fans of the composer are the discussions of his own music, and on ‘Style Modulation’. Finally, the biographical chapters on Dickinson which open the book will be of great help to writers and critics of his music, as well as containing fascinating insights into many decades of musical achievement. All in all, this is one of those essential retrospectives featuring any composer, his life, works and interests to have been issued in many years. It will retain its impact through the coming decades for scholars, critics, listeners, poetry readers and performers.